DDr hc S P Balasubrahmanyam, is a multi faceted personality. He is a prolific singer, a music director, a film actor, and above all a very humble and kind human being. Though many know him for his mellifluous voice and perfect enunciation of words in the innumerable songs he has sung across languages, he is better known to his friends and fans for his down-to-earth humbleness, and his unwavering commitment towards giving back to the society at large. He believes that activities done to make the lives of weak and underprivileged better, however small, would cascade into overall betterment of the society that we live in. His many acts of generosity are done without attracting any publicity. For instance, his charity initiatives done through a SPS Charitable Foundation, which he has founded in memory of his father Shri S P Sambhamurthy, are almost always never publicized. He has raised funds for many a charitable causes through countless stage shows. He has lent his voice do the service to the masses by suing live shows to collect funds by way of ticket sale, etc, and he too has contributed money on many such shows. His passion for pan social upliftment is as equal to that of his passion for singing and music as a whole. He is a stickler for following rules of law, however infinitesimally minor, and extols virtue. His ardent fans, spread across the world, have been impressed by his ability to firmly have his feet on the ground while achieving dizzying heights of professional success. Following his ideals and values, and trying to imbibe at least a few of his qualities, fans of Shri S P Balasubrahmanyam formed a charitable foundation. During late 2006, a few of fans got together with the aim of providing support to the needy, and serve the society, without much fanfare; some of the principles that Shri S P Balsubrahmanyam lives by. As the news spread amongst the fans, many joined and donated towards the various causes that were being taken up. 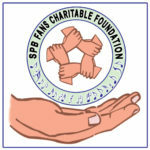 With the aim of streamlining the energies, efforts, and the activities of several fans of Shri S P Balasubrahmanyam, SPB Fans Charitable Foundation was established in September, 2006. The foundation initially was planned to be named as ‘SPB Charitable Foundation’. However, Shri S P Balasubrahmanyam insisted that since the fans and many individuals who contribute and undertake the effort, it shall, in the very least, be christened as ‘SPB Fans Charitable Foundation’. True to his commitment and character, he makes monthly contributions to the foundation. SPB Fans Charitable Foundation members from Andhra Pradesh, Karnataka, Maharashtra, Tamil Nadu scout for institutions which provide care and support for the weak, poor, destitute, orphaned, and marginalised sections of our society, but are in dire need of funds. A thorough verification is done on the activities of the institutions, subsequent to which, their requirements are sought. The foundation then procures and provides for material and monetary relief that would help the institutions most. Such donations and charity events are held at regular intervals throughout the year. In addition, blood donation camps are conducted from time to time. Many of the fans/ foundation members are registered blood donors, and have signed up for organ donations as well.